May is here and bringing cooler weather! The horses are loving the 50 and 60 degree temperatures! The herd this morning was particularly sassy and many of the horses were running around and bucking as we threw the hay from the trailer. We love watching the horses run free an have a playful morning. Only one more month until counselors and campers arrive and summer camp begins! 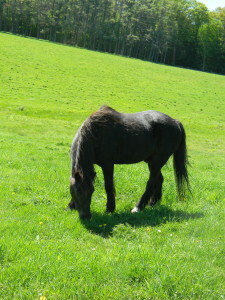 With springtime here in full force and the weather warming up, some of our horses are looking particularly well-fed. We are beginning to decrease the hay and grain we feed out to make sure our horses stay healthy. Many horse people know the intricacies of the equine digestive system, but for those who don’t we can share a little information about the uniqueness of horses digestive system. completely absorb the nutrients and prepare the waste for excretion! Horses actually have very sensitive stomachs and always want to be monitored for stomach aches. We always want to make sure each horse is accounted for at feeding and is happily munching on grain. 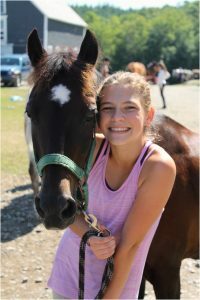 With colic, an upset stomach, as the number one cause of equine death, educating all horse people about digestive health in horses is one of the most important aspects of horse care. At Road’s End Farm, our horses are fed in the morning and at night time, a chore which every camper helps out with during the summer, and an opportunity to see the importance of maintaining a low-stress environment and feeding horses the proper amount of hay and grain with the opportunity to drink water.